, we announced the program that enabled hosting companies to integrate Google services into their platforms for easy access to their customers. Several hosting companies have adopted the program since then, and thousands of websites have benefited from configuring services like AdSense, Custom Search and Webmaster Tools. Today, we’ve taken an additional step to improve access to these tools. Parallels, a leading provider of control panel software for hosting companies, has integrated Google Services for Websites into Parallels Plesk Panel, used by millions of website owners globally to manage their sites. Any hosting provider using Plesk 9.5 can now enable Google Services for Websites for their customers. 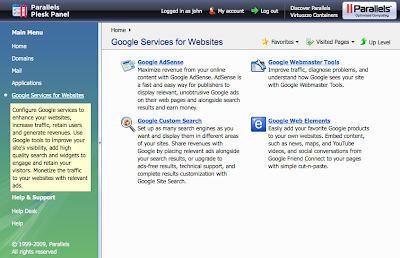 Website owners generate more traffic to their websites by optimizing them using Webmaster Tools. They can engage their users with inline Web Elements, including maps, news, videos and conversations. Custom Search and Site Search provide Google-quality search on their websites for better user retention. AdSense helps website owners monetize their sites with relevant advertising. And besides providing these valuable services to millions of customers, hosting companies can also generate additional revenues through referral programs. 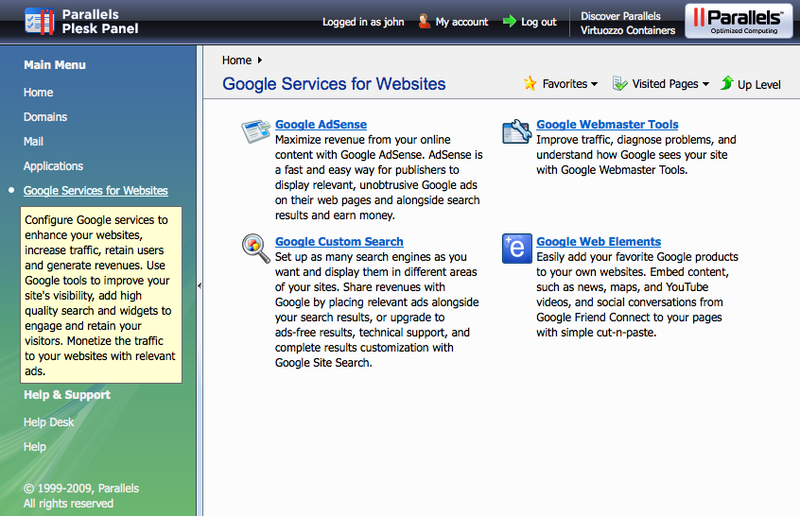 More information is on the Google Services for Websites page. If you are a hoster using Plesk, please contact Parallels for more information. You can learn more about the specific services integrated at the Inside AdSense blog, the Custom Search blog and the Webmaster Central blog. Last year, we announced the program that enabled hosting companies to integrate Google services into their platforms for easy access to their customers. Several hosting companies have adopted the program since then, and thousands of websites have benefited from configuring services like AdSense, Custom Search and Webmaster Tools.